Earlier today the BBC reported that European Stroke Research Network for Hypothermia (EuroHYP) has announced the launch of a major clinical trial – involving 1,500 patients in 15 centers across Europe – to evaluate whether cooling the body by 2 degrees can reduce the risk of death and disability in ischaemic stroke. 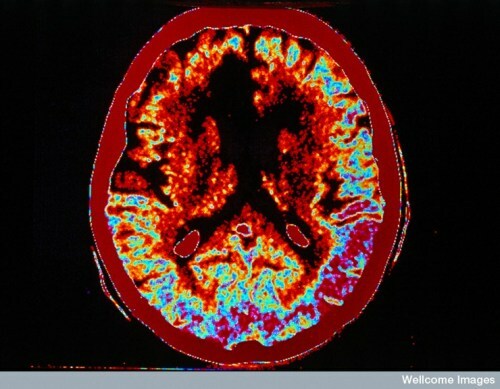 CT image of an ischemic stroke. The dark area in top left quadrant of brain shows the damaged brain area. Welcome Images. We are very pleased to learn that this trial – which has the potential to radically alter and improve the way in which ishaemic stroke is treated – has now received sufficient funding to go ahead. In another interesting report on the BBC today, scientists at the University of Colorado have reported that they have used studies of genetically modified mice to identify the mechanism through which the brain-derived neurotrophic factor (BDNF) interacts with other regulatory proteins to control appetite and body fat levels. In some people with the genetic disorder WAGR syndrome it was observed that having only one copy of the gene encoding BDNF was associated with excessive appetite and obesity, but until now the mechanisms through which BDNF regulates appetite was not clear. This research fills in another important gap in our understanding of how genetic differences between individuals influence the risk of becoming obese, and we know already that genetics makes a very large contribution to that risk. While the complex nature of the influence of genes on obesity means that it is rarely possible for a single medication to have a dramatic impact – though there are a few examples such as the treatment of leptin deficiency with recombinant leptin (following studies in the leptin-deficient Ob/Ob mouse) – increasing understanding of the influence of the impact of an individuals genetic makeup on their risks of becoming obese will aid the development of both new medicines to help combat obesity, and the development of more targeted lifestyle interventions that are more likely to be successful for that individual. Taken together these two items reported in the BBC highlight the importance of animal research to medical progress, both as a way to uncover the processes involved in health and disease in basic research, and as a way to evaluate potential therapies in order to obtain sufficient information to proceed to trials in human patients. More good clinical trial news that I missed earlier! On Friday the Cystic Fibrosis Trust announced that thanks to major grants from the Medical Research Council (MRC) and National Institute for Health Research (NIHR) they will soon launch their clinical trial of non-viral gene therapy for Cystic fibrosis. We briefly discussed the important role played by animal research in the development of this therapy in a blog post last August, and it is great to see that the UK Cystic Fibrosis Gene Therapy Consortium (UK CFGTC) has now raised sufficient funds to proceed with this exciting trial. The UK CFGTC has also announced that it received a further £1.2 million fund research to develop a lentiviral vector for improved delivery of gene therapy in cystic fibrosis, much of which will like earlier work on this vector require the use of animal models. Next Next post: Professor Doudet vindicated as investigation rejects animal rights allegations.